OUTER EAR: The outer ear includes the visible part of the ear – the part that keeps our eyeglasses straight or where you place earrings. 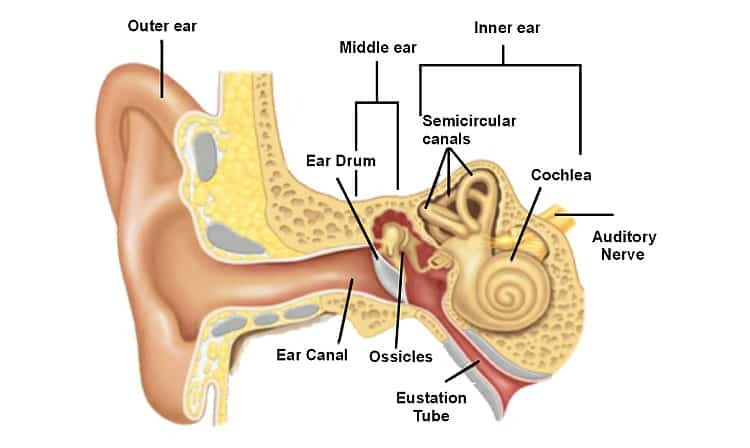 The outer ear also includes the ear canal and, down at the end of the ear canal, the eardrum. The outer ear funnels sound down to the eardrum – which moves in response to sound. Problems in the outer ear include but are not limited to excessive ear wax, infection or perforations of the ear drum. Hearing loss from problems with the outer ear are typically treated with medical procedures, medications or sometimes with hearing aids. MIDDLE EAR: The middle ear is the space between the outer and inner ear which houses the bones of the ear. If you’ve ever felt your ears “plug” when you have a cold or during an airplane landing, you’ve experienced a change in pressure within the middle ear. The middle ear bones transfer sound from the eardrum to the inner ear. Problems in the middle ear include but are not limited to infection, tumors, or stiffening of the middle ear bones. Problems with the middle ear are typically treated with medical procedures, medications, or sometimes with hearing aids. Hearing loss from problems with the outer and/or middle ear are known as a conductive hearing loss. INNER EAR: The inner ear plays a critical role in hearing. The cochlea is the sense organ of hearing (and balance). It is within the cochlea where sound energy is processed into electrical energy. That “electrical energy” is then transferred along the auditory nerve to the brain. Problems within the inner ear include, but are not limited to aging, trauma, hereditary factors, and disease. Hearing loss from problems within the inner ear are typically permanent and treated with hearing aids or cochlear implants. Hearing loss from problems with the inner ear are known as sensorineural hearing loss. Hearing loss from problems with both the outer or middle ear AND the inner ear are known as mixed hearing loss.